106/159 David Mumpower Maybe I would have enjoyed it more if I had kids. It seemed transparent as well as laborious. 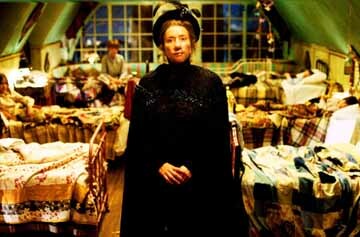 Nanny McPhee will tell the story of a magical governess who uses her special talents and skills as she works to sort out seven children who have a history of devouring their nannies. Sounds familiar, doesn't it? Though the story bears a great deal of similarity to the Mary Poppins books by PL Travers and the resulting 1964 Disney film, Nanny McPhee is in fact based upon a series of Nurse Matilda books that are famous in Great Britain. Emma Thompson is adapting these Chrstianna Brand stories for a glorious big-screen production. Where Mary Poppins centered around two children, Nanny McPhee will focus on seven naughty little boys and girls with the last name of Brown. Colin Firth will play the children's father, while Thompson herself will take on the title role. Also onboard are Angela Lansbury, who will portray the kids' aristocratic great aunt, and Gosford Park's Kelly Macdonald as the maid of the house.